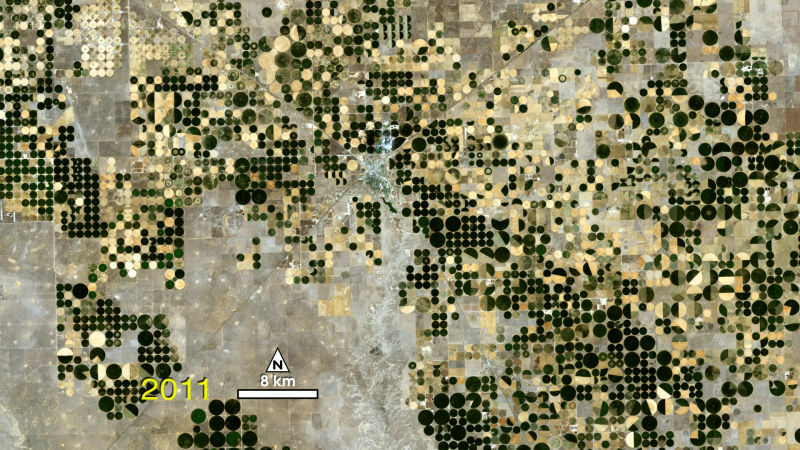 I really like this satellite image from NASA of center-pivot irrigated farm in Kansas - it looks like hundreds of pennies to me. What questions could we ask with this image? How much land goes unused in this image because the fields are planted as circles? If you could add smaller center-pivot sprinklers in the corners of the fields (and therefore, smaller circles) to cover some of the unused land, how many sprinklers would you need to cover over 98% of a field? What proportion of this land is covered in dark farms, and in light colored farms? Assuming irrigation costs were the same for both fields, how much more money could a farm make that planted in rectangular plots instead of circular plots of wheat? Which setup would best maximize use of the land - one big center pivot sprinkler (one circle on a square plot, two sprinklers that do a half rotation (two hemispheres on a square plot), or four smaller sprinklers that do full rotations (four circles on a square plot)? Why Are People STILL Upset with "New" Math? Are You Pumpkin-Spicing Your Classroom?